This early display of military occupation came on the day that our community would be preparing to celebrate one of our black nation’s heroes, Dr. Martin Luther King Jr.
King was one of the most influential leaders of our movement, having the ability to mobilize millions of black people in a moment. It was this influence that led to his assassination by the U.S. government and as an attempt to sedate the resistance coming from our communities across this country, that same government “granted” us a day to honor his memory, while dictating when, where, and how we can celebrate the memory of our martyr. 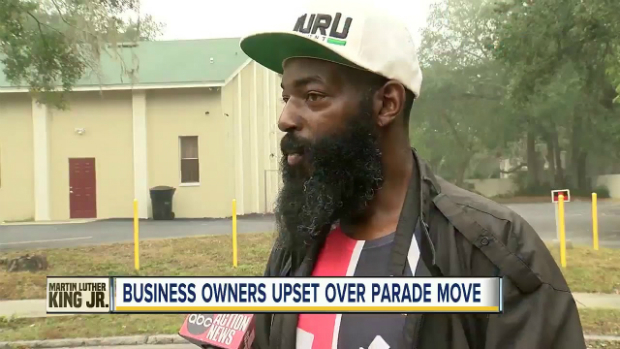 For years, St. Pete has been home to the largest MLK Day celebration throughout the south except for Atlanta, but in recent years, the city has stolen it, changing the route so it doesn’t come through the south side, locking down our community and attacking our community vendors. This year was the worst! They routed the parade through downtown St. Pete and tried to contain us all in one location by ending it at the Tropicana Field Baseball Stadium, “the dome” that sits on the graveyard of what used to be a thriving black community. The activities of MLK Street were shut down by 6:00 P.M. and the police encircled our community, displaying their ability to contain us at any given moment. Prior to the MLK Day festivities, our community was issued a threat from the chief of police, Anthony Holloway, that said if anyone of us were to vend in our community, we would be fined nearly $150! This proves that not only was this an assault on our right to assemble or an attack on convenience, but this is standard policy of the city. Just as we predicted, Rick Kriseman and his handpicked Negroes collaborated to further wipe out our community totally. Through the police, Kriseman initiated an attack on our community’s ability to be economically self-reliant. Denying us the right to vend while starving our community year round is part of the Kriseman regime. Part of this administration’s plans are to use the police to gentrify the black community and crush any form of economic development. All of our young people are left to participate in an illegal drug economy in order to survive. Our people are forced to shop at corner stores with hostile service from Arab merchants. We are forced to be homeless, forced into poverty, because of Kriseman and those who came before him! Following this lock down was a city hall meeting, where citizens were given an opportunity to voice their opinions during the open forum session. The room was overflowing with upset Africans who wanted to share their experiences, some even characterizing this display of police terror as “military occupation”. Members of the African People’s Socialist Party and the newly birthed organization, Communities United for Reparations and Economic Development (CURED), were present to make statements on behalf of the African community. The petty bourgeoisie was also present. The same forces who came out against the black community and supported Rick Kriseman, raised mild criticisms of the administration’s handling of the day and proposed for earlier notices sent by the police department, warning our community that the containment would be happening. Some of the more prominent members of St. Pete’s petty bourgeoisie got together afterwards to conduct private meetings with the police and other city officials to form a new police program labeled “MLK Day Parade and Festivities Task Force”, which was undoubtedly a Kriseman masterplan. According to the status quo, the solution to police containment is more police containment. Our community is saying no more! We understand that the solution to police containment is genuine economic development in the hands of our community! When our people have the ability to feed, clothe, and house ourselves, we can eliminate the idea that the presence of the police is necessary. So while the petty bourgeoisie is busy collaborating with the State to wipe out our community totally, we must take the stance to build for ourselves and we can do it! We’re calling on all vendors and those in the community that want to participate in building a real future for our people and who are tired of the same conditions of poverty and despair to come to the Uhuru House at 1245 TyRon Lewis Avenue (18th Avenue) South and let’s work to build our own markets, our own stores and our own community!